Brumunddal is the kind of place that you’d never give a second glance to as you drive through it. It’s a town just off Norway’s E6. With that road from Oslo to Lillehammer, the host city for the 1994 Winter Olympics, undergoing a conversion from a single-lane twisting route into a full-blown highway with all the bells and whistles attached, there’s even less chance of getting out of the string of weekend traffic of skiers and snowboarders winding the way bumper-to-bumper to the capital this late winter Sunday afternoon. It’s going nowhere slow. There are tall and sleek yellow cranes at each new overpass under construction, heavy Swedish earth-moving trucks and sturdy bulldozers where the new lanes will be sometime — but not sometime soon — and blowing snow is drifting across Lake Mjosa, the largest inland body of water in the nation of 5.2 million. Lillehammer is about 180 kilometres north of Oslo, and Brumunddal is two-thirds of the way there. And there’s a lot of roughly about to Brumunddal. Google it and you’ll discover it has a population of roughly 10,318, and it earned city status nearly a decade ago. And roughly, one tenth of its people were involved in an ugly race riot and simmering hate violence about 30 years ago. And since then, it’s a town that many Norwegians view with suspicion and scepticism. The race riots began when a local convenience store owned by a Pakistani immigrant was attacked, leading to a melee inspired by skinheads, bootboys and others who took to the street violence like ducks to water on adjacent Lake Mjosa. Even though the incidents happened almost three decades ago, it’s a reputation that’s endured. And that is one of the reasons why one of Brumunddal’s biggest boosters and largest real estate investor chose the hometown of his youth to make it reach new heights. Literally. Just beside that tortuous E6, the world’s largest wooden skyscraper has just been completed. The Mjostarnet Hotel proudly stands 85.4 metres high, and while it may be no bigger than a good proportion of residential apartment buildings across the UAE, it can at least boast that it recently won certification from the Council of Tall Buildings and Urban Habitat (CTBUH). That’s the world body that certifies building projects’ heights. Putting the Brumunddal tower in perspective, Dubai’s Burj Khalifa comes in at 828 metres — nearly 10 times its size. 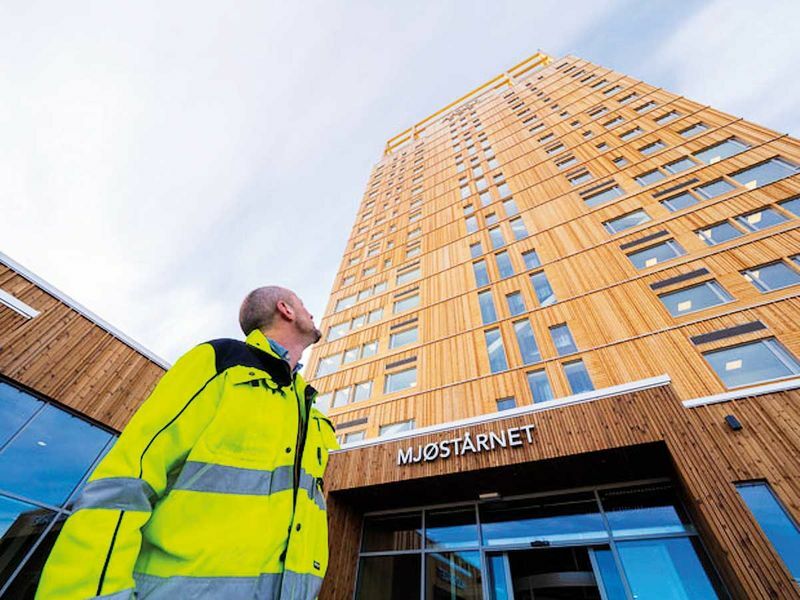 But as tall wooden buildings go, the Mjostarnet Hotel is a quantum leap upwards — the world’s previous tallest wooden building is the Brock Commons Tallwood House at the University of British Columbia in Vancouver, Canada. 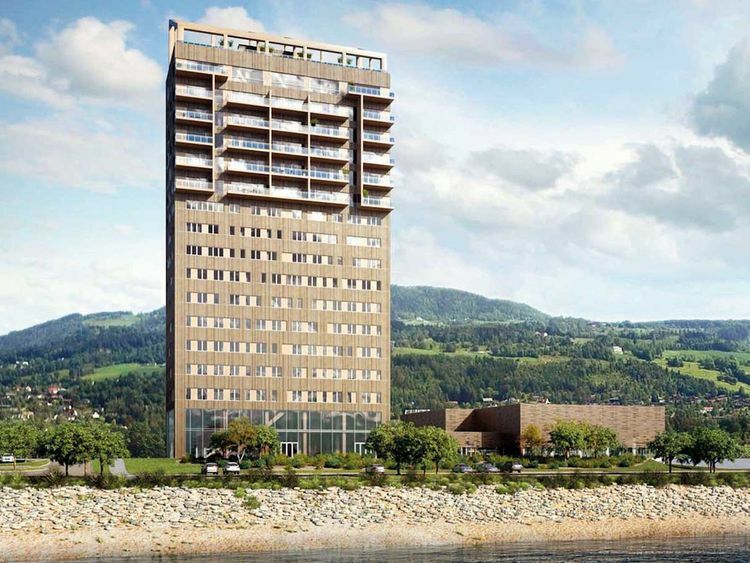 It stands at 53 metres, and Norway’s second tallest wooden building is an apartment block built in downtown Bergen on the North Sea coast — standing up at 45 metres. The Brumunddal tower consists of 18 floors of apartments, a hotel with 72 rooms between the eighth and eleventh levels, and as well as a restaurant, offices and commercial outlets. But Buchardt purposely choose Brumunddal because he grew up here, is aware of its negative image — and he wants to change that. He has lived there for 28 years and he said he wanted to give something back to Brumunddalers. With that in mind, all the wood used to build the world’s largest tree homes comes from the local area. “With this building, I wanted to signal that Brumunddal is an exciting place in the middle of the world,” he said. Traditional skyscrapers are used using reinforced concrete, poured cement and steel frames, allowing higher heights to be reached as well-practiced technological and engineering elements are refined. When it comes to wooden structures, there is a limit on how high the buildings can go, based on the stress limits within the natural fibres and the woods used. But these new wood towers use engineered wood — cross laminated timbers (CLT) or glue-laminated timbers — commonly called “glulam” that stack thin wood layers together with super strength glues and bonding agents. The result are beams that can tolerate high stress loads, are environmentally friendly, have a lower carbon emission footprint than concretes, and are renewable and recyclable. These new ultra-strong wood materials have created a small but fast-growing market. “Steel was the 1800s materials, concrete 1900s. Now we are in the 2000s and it is time for timber,” said Susanne Rudemstan, head of the Swedish Wood Building Council. She said trees must come from properly managed forests to avoid deforestation. And records are falling fast in the world of what some refer to as “plyscrapers”. 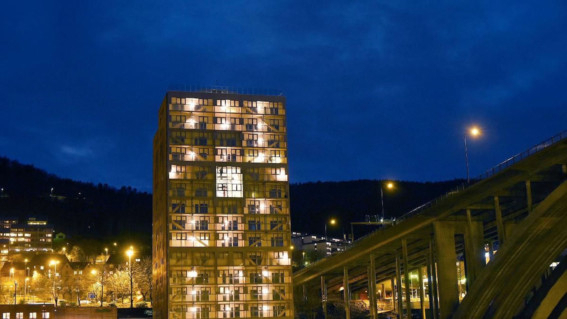 Wood “is definitely part of the solution when we’re struggling towards a low-carbon world,” said Ole Kleppe, who was the project manager at the Bergen wooden tower that topped out at 45 metres. The university residence building in Vancouver saved an estimated 2,432 tonnes of carbon dioxide compared to other construction materials — the equivalent of taking 500 cars off the road for a year. “It was quick, it was quiet, and there wasn’t a mess,” John Metras, managing director for infrastructure development at UBC, said of the construction site. Elsewhere, construction began last October on an 84-metre wooden tower in Vienna, due for completion next year. And architects are considering even taller blocks, such as a 300-metre “Toothpick” in London. But building with CLT is 10 to 15 per cent more than with masonry or cement in the main European market, but experts say prices may fall as the industry matures. The use of CLT often shortens construction times because many parts can be pre-fabricated. The frame of the Vancouver high-rise took less than 10 weeks to build, which Metras said was much shorter than for a concrete building. LafargeHolcim, the world’s biggest cement maker, says plyscrapers are only a marginal threat to an industry dating back to the Romans, who built the vast concrete roof of the Pantheon almost 2,000 years ago. “Concrete is the most used building material in the world by far — about 30 billion tonnes (a year) ... It’s affordable, resilient in time against weather, earthquakes and fire,” said Bernard Mathieu, head of sustainable development at LafargeHolcim. He disputed that timber is better for the environment than cement production, which he said accounts for 5 per cent of world emissions of carbon dioxide. By contrast, he said trees also play a role in climate change because they absorb carbon dioxide from the air to grow and release it when they are burnt or rot. Big losses of forests, often burnt to make way for farms, cause up to a fifth of world emissions, scientists say. The timber industry says, however, that wood from properly managed forests can help to limit greenhouse gas emissions by locking up ever bigger amounts of carbon in buildings. Finnish wood, paper and packaging giant Stora Enso guarantees its CLT comes from sustainable forests. It says global CLT production capacity grew to around 1 million cubic meters in 2016 from almost nothing a decade ago. “CLT has the ability to compete with concrete and steel for larger, taller, multi-storey construction applications,” said Cathrine Wallenius of Stora Enso. CLT production began in Germany, Austria and Switzerland and is now spreading beyond Europe to North America, Japan and Australia, said Matthew Fonseca, a forest expert at the UN Economic Commission for Europe. He said a recent forecast of 1.3 million cubic meters of global CLT production by 2021 seemed conservative. Even wooden buildings have not completely eliminated steel and concrete. The roof terrace of The Tree, for instance, has a concrete floor. “It was necessary to add weight,” said Per Reigstad, of Artec Architects who led the project. The concrete is to keep the building stable in high winds or even rare earthquakes.